5/22/2007 - At the National Conference on Anticoagulation Therapy, a presentation was given by Scott Kaatz, MD, regarding the different metrics for determining therapeutic time in range. Three different methods were identified and discussed by all who attended. 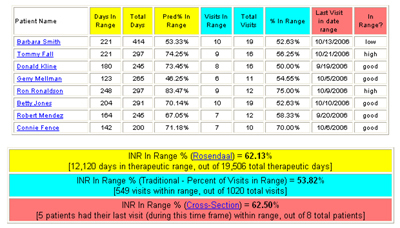 This looks at how many visits had INR results in range, and divides by the total number of visits. If the patient has had 8 visits, and 6 had readings within their therapeutic range, then the patient is considered in range 75% of the time. This method takes a specific date in time, and all patients are evaluated on the last reading prior to that date to see if they were within range. The number of patients in range (on their last reading) is taken as a percentage of the total active patients on that date. This is the most complex of the calculations, as it looks at the amount of time between visits to determine how long the patient might have been within their therapeutic range. If a patient has a therapeutic range of 2.0 - 3.0, and on May 1st tested at 2.5, then tested 3.5 on May 31st, then we can determine how many days were in range. Since there were 30 days beween tests, you assume that the patient slowly moved from 2.5 to 3.5 over those 30 days, so around May 15th, the patient was probably over 3.0, and therefore was out of range. Therefore, we estimate that 15 days were in range, and 15 days were out of range (within the 30 day time period), which means the patient is within range 50% of the time. The group consenses, as well as the conclusions from Comparative Evaluation of Measures of Time-in-Therapeutic Range, recommend that all three metrics be utilized to manage anticoagulation patients within a clinic or medical group.